This holiday park is located at an altitude of 1500 meters on the southwest, at the ski station Pra-Loup in the south of the Alps. 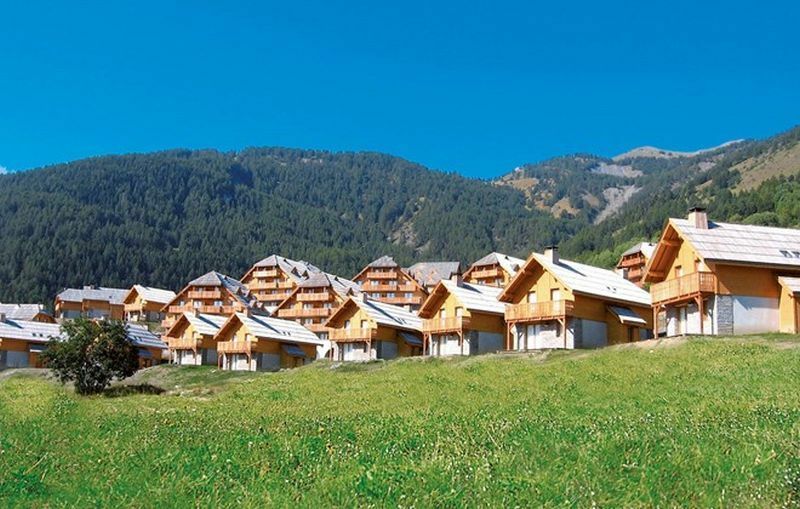 The holiday park offers a magnificent view of the surrounding mountains and around it you will find a forest of larch trees. The holiday park consists of 136 apartments spread over several buildings of a maximum of 2 floors. The holiday village is located 800 meters from the ski lifts and some basic facilities (small supermarket, petrol station, restaurant). You will find a reception, a hall with a luggage room, a ski storage room, a laundry, a parking space and a free indoor heated swimming pool (40 m2) with a terrace and solarium. For a fee there is also a sauna and a hammam and a covered parking garage (limited parking spaces). At the reception you can buy bread and fireplace wood on request. Bed linen is included in the rent. For an additional fee you can reserve extra for the final cleaning and a baby kit. Pets are reserved for a fee if they have a valid vaccination certificate and are kept on a leash. The ski station is located between two places, for which you can use the free shuttle bus every half an hour. The studio apartment with cabin is suitable for six people and has an area of ​​35 m2. It consists of a living room with a double bed and a double bed, a cabin at the entrance with a bunk bed, a kitchen with a vitroceramic hob, an oven, fridge with freezer and dishwasher, a bathroom with a separate toilet. You have the following facilities at your disposal: free internet at reception, free outdoor parking space. You can pay the additional services on arrival. This residence is an ideal holiday destination, just 800 meters from the new telecabine with ten places and a small supermarket. You can use a heated indoor swimming pool, if reserved, mandatory swimming cap, swimming trunks, sauna and hammam for a fee, if reserved. You have free WiFi internet at the reception, there is 1 free parking space per apartment outside and inside you can reserve a parking space for a fee, there is a limited number of places available. There is a free shuttle bus at the resort every 30 minutes. For an extra fee you can reserve towels or a baby kit with a bed bath and booster seat or a final cleaning package. For a small fee you can use the laundry or request a change of bed linen. Bed linen is included in the price, change is for a fee. Pets are allowed for a fee, provided they are kept on a lead in the residence. You can also book: fresh bread and croissants, fireplace at the reception one day in advance. Deposit: two separate payments consisting of apartment and cleaning and tourist tax, both to be paid on arrival. The deposit will be returned to you after the inventory on the day of departure or by post. The accommodation must be left perfectly clean. If that is not the case, part of the deposit will not be refunded. This area is at a height ranging from 1500 to 2600 meters and is therefore very suitable for the experienced skier. The ski domain is about 180 km long and has 15 green runs, 26 blue, 34 red and 5 black. The domain offers 50 ski lifts and 252 snow cannons. There is also a rider park, 5 rider cross and two sliding (sled) slopes in Pra Loup. There are plenty of other sporting activities such as snowmobiling, hiking on special snowshoes, paragliding, tennis (covered track), quad biking, hang gliding, skating (natural ice rink and much more) and there is also a cinema and bowling at about 7 km. Most shops are centrally located, in an outdoor gallery with 17 boutiques, 28 restaurants, 4 bars, a post office and a cash machine.The winter events include Snowball Tour, Généroglisse and fireworks.The National Parc Mercantour is perfect for snow-hikes and the place Barcelonette is even a chocolate museum. The distance from Utrecht is about 1190 km.